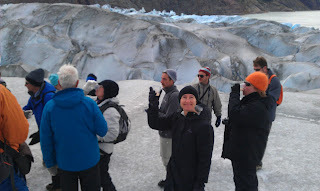 Another day and another glacier but we experience each one in a different way. 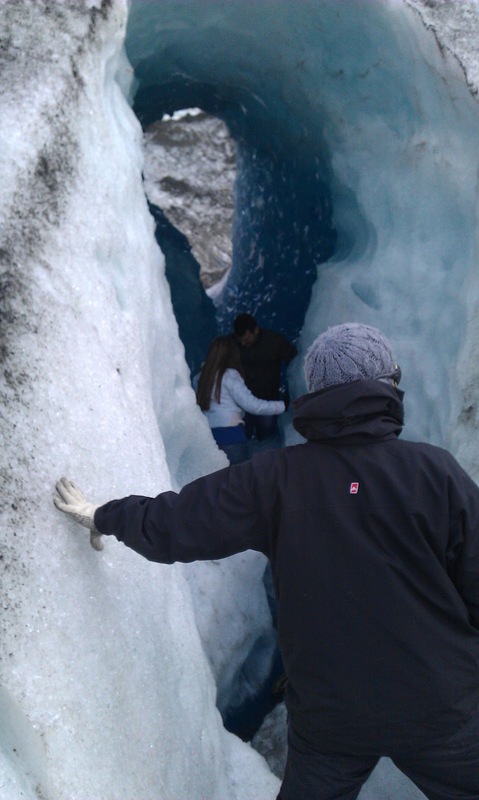 Today it´s personal, the actual walk on a glacier itself. Our choice for this closest of all activities is the Viedma glacier at El Chalten. This glacier is the 2nd largest in South America at over 900 sq km in surface area and 150 to 200 m deep. First off after being dropped on the bank by the boat is a 30 minute walk to the glacier along a landscape of very smooth colourful boulders of reds, oranges, pinks and browns. 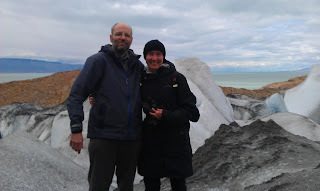 We are told that only 22 years ago that landscape was covered in ice, that is how fast this glacier is shrinking and adding to rising sea levels. Once at the glacier we attach crampons to our shoes, large spikes that sink into the slippery ice and provide grip as we walk at angles of 45 deg and more. We are taught to waddle like ducks with bent knees and thump our feet so that the spikes get deep and grip. What followed was an hour and a half of walking on a totally alien and unique landscape, both beautiful and terrifying at the same time. Around spiky and over smooth ice, through ice tunnels where it was raining on you and the surface was a fascinating translucent smooth deep blue, and stepping over crevasses where you could not see the bottom. There were even lakes, caves and waterfalls. This is definitely one of the coolest things to do (pun intended). At the highest point on our journey the tour guides used a pick axe and plastic cups and we drank Bailey's cooled by vintage 500 year old ice, nothing tasted better or cooler. Special mention to the guides who were excellent, and seemingly everywhere as they virtually ran around the ice watching us all. I especially worry about Elizabeth as she has a habit of watching the scenery more than her feet, but at one point when she seemed off balance a guide came from nowhere lending a hand. Even though at times I was scared silly, this activity was amazing and goes down in my top three of things I have done, the other 2 being scuba diving at the barrier reef and flying an aerobatic plane. The first video below is of Elizabeth as she enters a tunnel in the ice and the second she is stepping over a crevasse. The next day was a more leisurely trek (only 6 hours) to get a better view of the impressive Fitzroy mountain. Sheer solid granite going straight up, it is an imposing site. You would think little toilet breaks in the wilderness would be simple but groups of trekkers seem to be only minutes in front or behind you, it is amazing how busy the wilderness is. This is an amazing world, and a month into my travels it has already exceeded my expectations. Wow pictures (and video) look amazing! 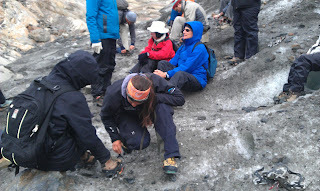 I don't suppose taking chunks off the glacier for ice blocks will help the shrinkage situation? Nope. Travelling is definately a double edged sword. How better do you learn about the world and its many wonders, but you do affect the environment. Tourism does help the economy and most places use the opportunity to educate about the environmental issues and use the money to protect and maintain sensitive areas. So I hope my damage is light and sustainable. Amazing trip you're having. Couldn't help laughing at the thermal ontop of thermal and jumpers under jacket situation when you went camping at "the end of the world". The glaciers look so surreal, wow, like another planet. They were like being on another planet, the experience was amazing and one of lifes high points. Will be seeing you soon.